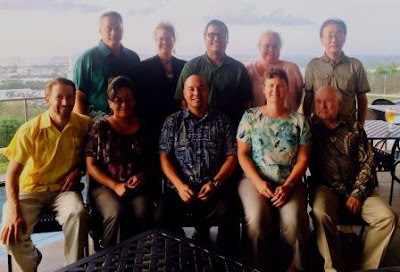 The Micronesia Conservation Trust Board and management staff met in Guam at the Ernst & Young Office from September 23-25, 2015 to adopt a new 3 year (2016-2018) Strategic Action Plan for the organization and to organize its Board of Trustees. The organization, which was established in 2002 to support local, national and regional programs for biodiversity conservation, climate change adaptation and sustainable development for the people of Micronesia, adopted a new vision "Enduring partnerships that conserve our land and sea to improve quality of life for communities across Micronesia" and will focus on three main impact areas including Conservation, Climate Resilience and Sustainable Livelihoods. Outgoing Board Chairman, Mr. Kembo Mida, Esq., stated "MCT strives to be a world class organization, that is truly Micronesia". This basically represents that the MCT Board and management work hard to meet the requirements of international donors in order to bring more financial and technical resources to the region, while maintaining its ability to prioritize and focus on the needs and aspirations of local communities by making its programs highly accessible to them. At the meeting, the Board and the senior management team, William Kostka, Executive Director, Lisa Andon, Deputy Executive Director, and Meileen Albert, Finance Officer, were able to finalize MCT's 2014 annual audit with Ernst & Young, as well as receiving an update on MCT's investment portfolio from Jason Miyashita and Maree Pelkey of the Asia Pacific Group of Raymond James. During its three day meeting, the Board also welcomed three new Trustees, including former Lt. Governor Diego Benavente of the Commonwealth of the Northern Marianas Islands, Mr. Haser Hainrick, current Public Auditor for the Federated States of Micronesia, and Mr. Julian Aguon Esq., a private lawyer in Guam whose practice focuses on international and regional human rights laws. The Board and staff also bid farewell to two of its greatest leaders who had each served two full terms over the past six years. Mr. Kembo Mida, who had served as Chairman for the past two years, and Mrs. Denise Adams Boylan, representing the private sector, who served as the organization's Board Treasurer. They leave the organization in the capable hands of the new leadership of Chairwoman Doreen deBrum, Assistant Secretary for the Ministry of Foreign Affairs for the Republic of the Marshall Islands, Vice Chairman Elbuchel Sadang, Minister for the Ministry of Finance for the Republic of Palau, Mr. Jared Morris, CEO of the FSM Petroleum Corporation/Vital as Secretary and Mr. Haser Hainrick as Treasurer. The MCT Board of Trustees has four standing committees which include the Governance Committee, Chaired by Trina Leberer, the new Director of The Nature Conservancy's Pacific Program. Members of the Governance Committee include Julian Aguon and Doreen Debrum. The Finance, Audit and Investment Committee is Chaired by the new Board Treasurer Haser Hainrick, with Finance Minister Elbuchel Sadang, and International Trustee Megumi Araki, currently with Japan's Association for the Promotion of International Cooperation and formerly with the Asian Development Bank. The Partnership and Development Committee is Chaired by Carlotta Leon Guerrero, formerly the President of the Association of Pacific Island Legislatures while serving in the Guam Legislature and currently with the Ayuda Foundation, a humanitarian organization in Guam who has been very active in the Maysak and Saudeleur typhoon recovery efforts in Chuuk, Yap and the CNMI. Diego Benavente and International Trustee Dan Martin, formerly with the MacArthur Foundation and based in Washington DC, are the members of this committee. And finally, the Technical Committee, which is currently chaired by Jared Morris with Trina Leberer as member. MCT's Technical Committee is the only committee which includes non-Board member scientists, community experts, and academics etc. to assist MCT with its grant-making and capacity building programs. "Along with its numerous community development programs, MCT was selected in 2006 by the Presidents and Governors of the Micronesia Governments and the Global Environment Facility-United Nations Environment Programme, The Nature Conservancy and Conservation International to serve as the financial mechanism for the Micronesia Challenge Endowment Fund(www.micronesiachallenge.org). We now manage an ~$18,000,000 endowment for the Micronesia Challenge. The Board and management take this responsibility very seriously and have made sure over the years to have appropriate leadership, systems and processes in place in order to assist the Micronesia Governments succeed in delivering on this initiative, which they made as part of their commitments to the United Nations Convention on Biological Diversity and their gift to the world", says Chairwoman Doreen deBrum.